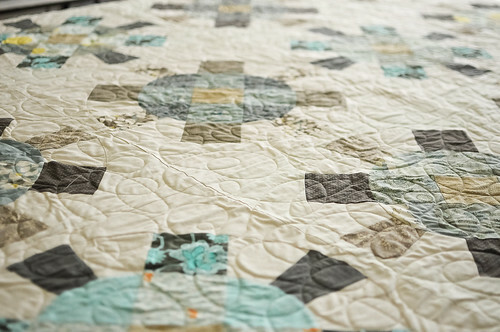 Finishing a quilt is a true labour of love. Most people think that you sew together a bunch of fabric into patches and there you go, a quilt. Oh NO. A quilt is about twenty times more work than that. There is the back of the quilt (for me, often improv pieced), basting the quilt, quilting all the layers together (this is where most people get stuck) and then sewing on binding. Don’t forget a quilt label too! To anyone who has ever finished a quilt, I applaud you. It is a long road to finishing even the most simple of quilts, but it is so worth it in the end. To be honest, I would make quilts all the time, every day if I could. I finally feel like I have worked up to understanding how to finish the quilts that I start. 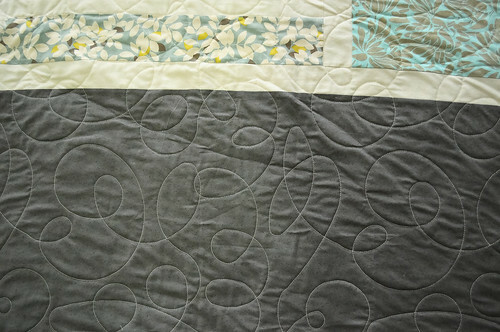 This has meant getting over my fear of machine quilting and starting to explore free motion quilting. But it has also meant sending off my first quilt to a long arm quilter. It’s a scary proposition, sending off your quilt top and back to someone else to have them quilt all over it. Amanda uses Lindsay to do her long arm quilting. Lindsay quilted her Halloween Swoon quilt with the coolest spiderweb pattern. A recommendation for a long arm quilter is a MUST. I also got to meet Lindsay at the Sewing Summit in Salt Lake City. She is a sweetheart and even though she lives in Virginia, I felt really good about sending away my Cog & Wheel to her. I wanted a swirly pattern, so Lindsay sent over some options of designs she suggested. I chose one that is called ‘Signature’. I liked that it appeared to be more random. I think it looks really good with the Cog & Wheel design. 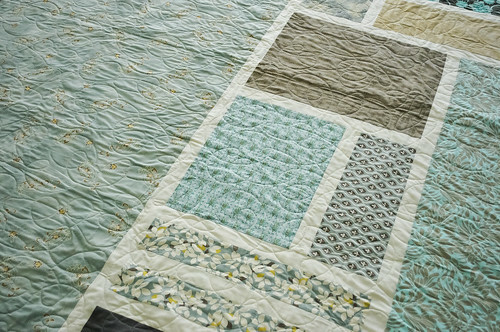 I know some people who always send their quilts out to be quilted. 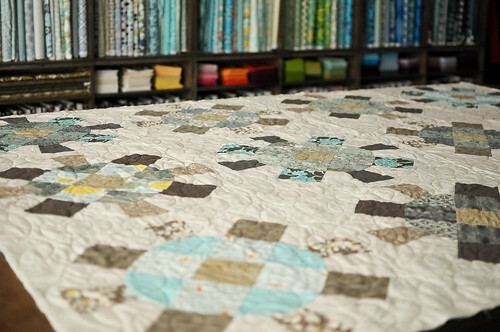 This way they can enjoy the patchwork process and finish more quilts. 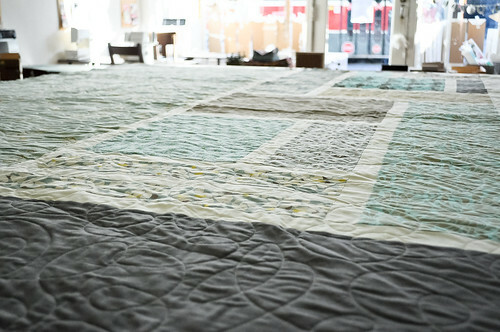 I will probably try to do the quilting on my smaller quilts and have Lindsay work on my larger bed-sized quilts for me. It is really exciting to receive a box in the mail, open it up and have your professionally quilted work all bundled up inside. I cut the binding last night and I’m looking forward to spending some time sitting under the quilt while I hand stitch the final step. p.s. Happy New Year! I’m picking out my first blocks to start my Farmer’s Wife Sampler this week. I’ll post about it soon. Oh, it’s lovely!! Thanks for posting multiple pics! It’s beautiful, the front, the back, the quilting, all of it, just beautiful. I recognized some the of the fabrics that I have in my own stash…hmm…this may be the inspiration I need to use them. Karyn, that quilt is so beautiful! I’m always so impressed with your colour/fabric choices. 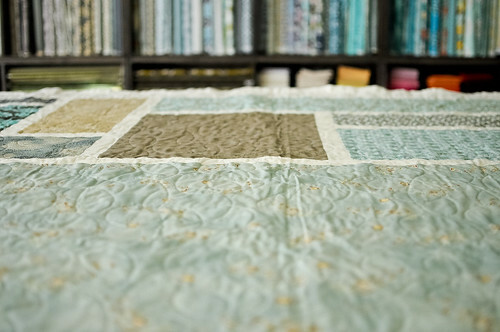 You’re right that making a quilt from start to finish is SO much harder than one would think. I’ve toyed with the idea of sending my quilts off as well. thanks so much for sharing your experience!!! this is an amazing finish!! I love the way you quilted it. I should really try something similar because I want to get better at free-motion, but I’m not a huge fan of the stippling that you see so often. Your loopties are perfect! Jessica recently posted..My Year in Sewing! 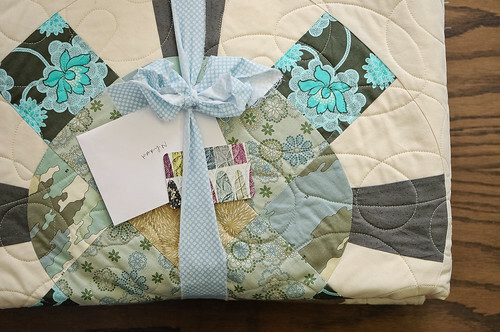 That quilt is a true work of art Karyn… so beautiful! The colours, the finishing, the choice of fabrics. The swirl is lovely. It looks like the energy being tossed around by the gears. And it looks wonderful on the back, too, especially in that big swath of aqua with yellow. I totally forgot that that was an option. 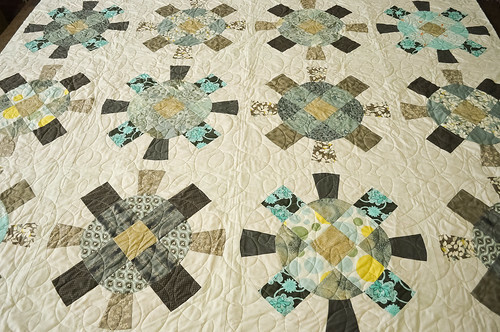 I like the patchwork and cutting part, but I could never really get my head around the quilting part. Is it expensive to send it off like this? It looks so nice. That quilt is gorgeous! I have just started quilting myself, and my favourite part is actually the hand-quilting process, at least for now. So beautiful!!! I love it! it’s totally amazing Karyn, i can see how much love and inspiration you put into it. beautiful. What a fantastic finish! 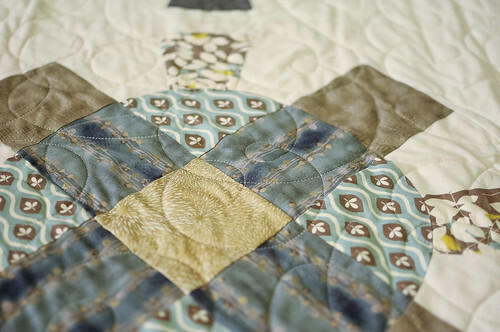 The quilting is perfect and really compliments the amazing piecing! so perfect! I can’t even handle it. This quilt is absolutely gorgeous, I love the back especially. Man you quilters amaze me. I don’t know how you do it. is it wrong of me to say i love the back a little more than the front? the color palette is divine; such soft lichen-like colors. 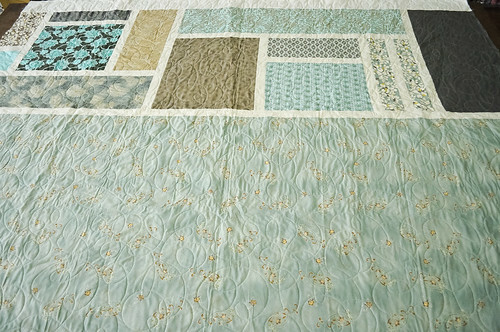 I stumbled upon this quilt via Tumblr, and I must say…this is the prettiest quilt I have ever seen. It’s so elegant looking, and the color palate is gorgeous! I wish I could buy this, because I would in a heartbeat!